I'm still getting used to not having that sleep-late-wake-up-late routine. I think I'm getting eyebags pffft. SO.. Many 2008 form 4's have been telling me how tought pure science will be.. bla bla etc etc. I don't think it's really hitting me in the face yet, but yea.. Addmaths was pretty confusing in the start. I'm feeling pretty beat today. Slept late last night. And there was Mesyuarat Agung as well as Editorial Board meeting. Prolly joining Graphics Department.. cause apparently they're short of people who knows how to photoshop. Xian Qi's in charge! She makes the most awesomest graphics, ever. But actually I thought it would be cool to join advertorial department.. where I can put my convincing (big companies) skills into good use! AHA. I changed club every year, noticed.. But I actually joined only at form 2. I thought scouts was only open for guys. And pandu puteri for girls (brownies). We had hands on experience from the P.p teachers. haa..
Sports has always been Tennis. I didn't go for a single lesson last year! Unlike full attendence during form 1 and 2. ZOMG COACH IS SOO GONNA KILL ME. Nab and I want to join debate team!! But we still lack of a member. Haiyah my class people all in those groupies. One group make noise, one group nerd out, one group chitta-chat-chat.. etc. People should seriously mix around more. The class is so.. segregated. I'm sitting in the corner with Nabster. And Kah Soon and Su Wee behind. Nabilah bursting out with a song every 5 minutes, Su Wee joining along ( Oh the horror! ), Kah Soon's obsession with watching the gardener's EVERY MOVE.
" EH, YOU KNOW WHO'S THE COOLEST GUY IN SCHOOL?" " THE GARDENER! Dan cool lah got sunglasses somore"
Well when we have seriously nothing to do, watching the gardener is rather amusing. One time, he has this thick beanie-like hat on his head, and he rolled it over his WHOLE face and he looked like those burglars who robbed banks in Marvel comics. Oh, the finishing touch was that there were two holes on the beanie for his eyes to look thru that beanie. Oh. And dwayne stole the gardener's pitch fork and brought it to class. ERRR. And my class has 3 dustbins now. Emily has to bear with my random bursts.
" I try-ee-aaii-ee-aaaiiiieeeee to something something something"
The song goes on but I simply cannot remember the lyrics. Awesome peeps I sit with. ZOMG AFIQ, I'm SO JEALOUS OF YOU FOR HAVING A COOKIE. Getta marvel at the gloriousness of the sleek hp. But I like LG Icecream. Not the colour tho, too easter bunny. I had a sugar high today. Burst out really suddenly laughing around like some madwoman. I gave a really lame excuse of being happy cause I saw something in yellow at that very moment. Yes, I am very much aware of my lameness. And Smk Bud (4) now have a ROTI CANAI STALL. Somehow I find this odd for a school cantin. 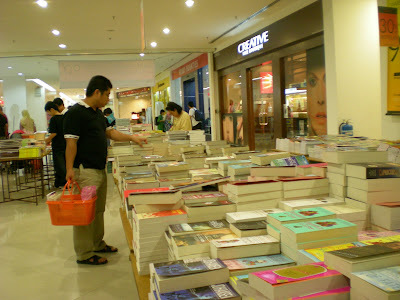 I think this time it was really good, they updated the usual pile of below-rm 30-and-discover-new-titles category. 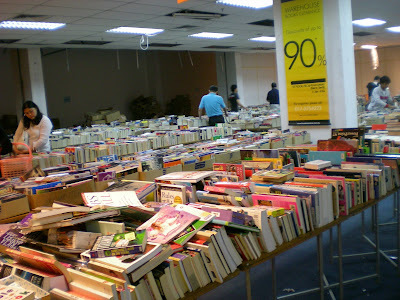 Instead of like the lousy MPH warehouse sale which only had mostly the usual books found in book stores for like a mere rm 3 difference. 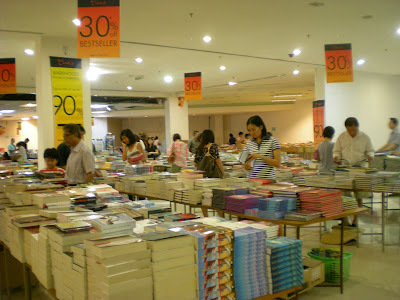 Usual bestsellers were sold 30 % off! 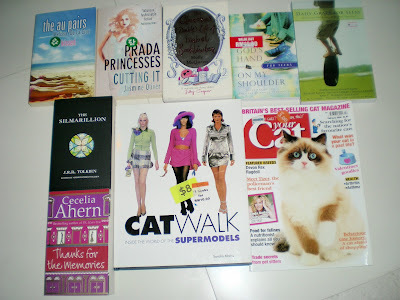 I finally got a copy of Thanks for the Memories by Cecelia Ahern. Same with The Silmarillion by J.R.R Tolkien. And got a big bunch of books that caught my eye. 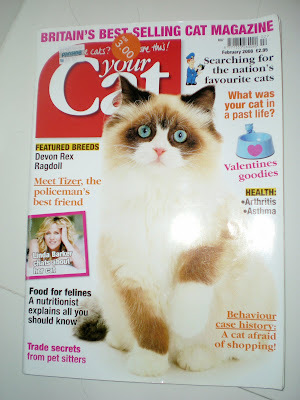 Chick-lits, daily grace, fantasy, as well as A MAGAZINE ABOUT CATS LOL. I wanted the the Tales of Beedle the bard by J.K rowling. But it was only released last month, so I doubt they would actually want to sell it off discounted. Twilight series was, out of question, not sold there. 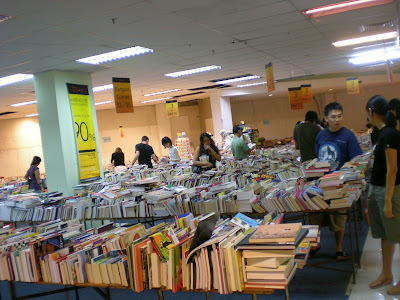 The sales lady said even their warehouse didn't have any stock for the bookstores. What a huge fan base Stephanie Meyer has. Value-for-money section. 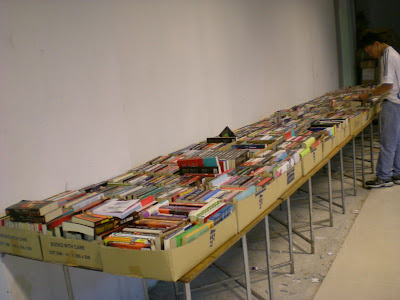 You have to scan every title and dig out good books. Sometimes you can get a really good read for under rm 12, and such. I got a mint condition GossipGirl novel for a mere rm 8. What a steal heehee. All messy and stuff. Bound to get a headache after glancing thru all those titles! The only downer was that there weren't the usual spread of from-rm 17.90-to-rm5 spread of Australia's GIRLFRIEND magazines! Maybe this is a sign that I'm having too many magazines? When I weight all of them, I think the wieght of my magazines added up to over 150 kg. FEMALE, VOGUE, SEVENTEEN, GIRLFRIEND, FLAVOURS. Me = Magazine hoarder. AHA. Anyways, here is my loot. Mind you, this is just MINE.. Should see what the whole family bought AHA. At least I'm not buying as many as I used to. ehee. Yalah yalah I love cats. This is such a wacky magazine. For serious cat aficionados. Well, it was rm 3. 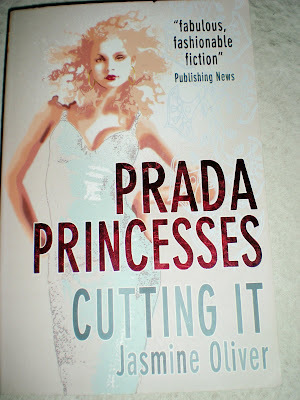 I love books about behind-the-scenes of the fashion industry! Glamorous and dramatic. Like The Devil wears Prada, Everyone worth knowing, Fashion Babylon, etc. HAD HAD HAD TO. It's so glam retro. Love the fringe details and how it swings with every move and the georgeous lace bodice. Oh. I didn't like the price. 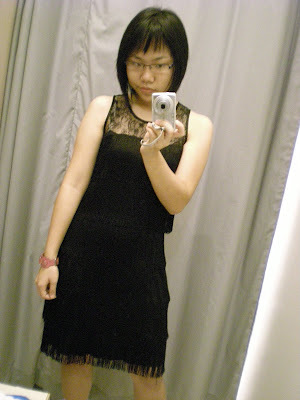 It costs rm 333. Oh. 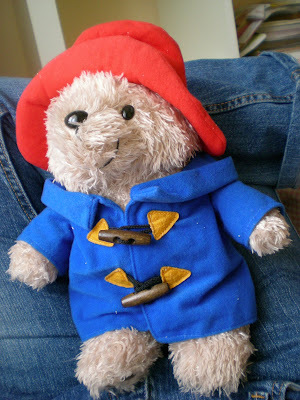 And Paddington Bear says Hi and he won't share his marmalade sandwiches! Till I write my own novel! lol.